Some people have an uncanny ability to visualize exactly what they want – and then describe it to others. For everyone else, there’s Pinterest. The popular website where people save and share photos from around the internet has quickly become an indispensable tool for collecting inground pool ideas. Using Pinterest, you can store (or “pin”) any image you find online to your own webpages (or “boards”) for easy viewing. Pinterest is one of the fastest growing social media sites, and is especially big with people planning home improvement projects. As you might imagine, there are plenty of pictures of pools – inground, above ground, concrete, fiberglass, etc. It’s already a treasure trove of ideas, and you can add your own pictures when and wherever you find them. Simply put, if you’re not using Pinterest to brainstorm your new pool design, you should be. Here’s how to get started. To get an account with Pinterest, just go to their signup page and log in with Facebook or Twitter. Alternatively, you can create an account using an email address. If you come across a picture of a pool with really cool landscaping, you can then pin it to the “Pool Landscaping” board. When you go back to view your pictures later, you’ll know exactly what it was about that picture that inspired you. You can add a detailed comment as well. When you pin something, that photo will show up in various feeds, including those of any other users who are following your boards. However, if you’re not interested in sharing your finds, you can simply mark your boards “Private.” That way, only you will be able to see it. You can find plenty of ideas already on Pinterest just by using the search function. However, Pinterest makes it very easy to pull in photos from around the internet with its “Pin It” button. Once installed, it sits on your browser’s toolbar and allows you to pin any image to one of your boards – even when you’re not on Pinterest. Once you have the Pinterest button on your browser, saving images you come across online is easy. 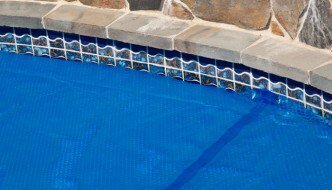 Almost every pool company has a website with an image gallery, so there’s plenty of material out there to draw on. Save your favorite images to your boards, and view them all in one place at your leisure. It just so happens that we have an account with Pinterest where we collect all the best swimming pool pics we come across. Check out the Pool Pricer Pinterest page (say that three times fast), and follow one or all of our boards to get updates on your Pinterest homepage. As you can see, Pinterest is a remarkable way to visualize your new swimming pool (or any home improvement project, for that matter). It’s nice to know you can log on and find all the pictures you’ve collected in one place, organized in whatever way makes sense to you. By pinning pictures of awesome pools from around the internet, you’re also rewarding pool companies by giving their work additional exposure. Pinterest automatically adds a link back to the pool company’s site, making it easy for you or anyone else to find out more about the builder. Collecting pictures is simply a way to put together the best aspects of different pools. Even if you’re only at the stage of dreaming about building your own pool, it’s fun to pick out the different features you would want. If and when you actually commence your project, you’ll have these photos handy to serve as a guide. Can You Really Find a Pool Builder Online?